Northwestern Medicine scientists have identified a component of the herpesvirus that “hijacks” machinery inside human cells, allowing the virus to rapidly and successfully invade the nervous system upon initial exposure. Led by Gregory Smith, associate professor in immunology and microbiology at Northwestern University Feinberg School of Medicine, researchers found that viral protein 1-2, or VP1/2, allows the herpesvirus to interact with cellular motors, known as dynein. Once the protein has overtaken this motor, the virus can speed along intercellular highways, or microtubules, to move unobstructed from the tips of nerves in skin to the nuclei of neurons within the nervous system. This is the first time researchers have shown a viral protein directly engaging and subverting the cellular motor; most other viruses passively hitch a ride into the nervous system. 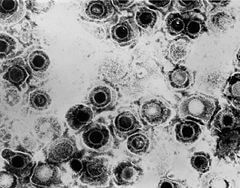 Herpesvirus is widespread in humans and affects more than 90 percent of adults in the United States. It is associated with several types of recurring diseases, including cold sores, genital herpes, chicken pox, and shingles. The virus can live dormant in humans for a lifetime, and most infected people do not know they are disease carriers. The virus can occasionally turn deadly, resulting in encephalitis in some. Until now, scientists knew that herpesviruses travel quickly to reach neurons located deep inside the body, but the mechanism by which they advance remained a mystery. Smith’s team conducted a variety of experiments with VP1/2 to demonstrate its important role in transporting the virus, including artificial activation and genetic mutation of the protein. The team studied the herpesvirus in animals, and also in human and animal cells in culture under high-resolution microscopy. In one experiment, scientists mutated the virus with a slower form of the protein dyed red, and raced it against a healthy virus dyed green. They observed that the healthy virus outran the mutated version down nerves to the neuron body to insert DNA and establish infection. “Remarkably, this viral protein can be artificially activated, and in these conditions it zips around within cells in the absence of any virus. It is striking to watch,” Smith says. He says that understanding how the viruses move within people, especially from the skin to the nervous system, can help better prevent the virus from spreading. Smith’s team will next work to better understand how the protein functions. He notes that many researchers use viruses to learn how neurons are connected to the brain. “Some of our mutants will advance brain mapping studies by resolving these connections more clearly than was previously possible,” he says. Hey, let’s make a mutated version of the Herpes virus and screw around with its genome, what could possibly go wrong? Those were the last words of the poor fool who inadvertently created GonnorHerpaSyphyllAids. Upon creation, the virus let out an audible battle screech and proceeded to become airborne, with actual wings. God save us all.